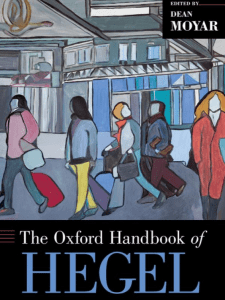 The Oxford Handbook of Hegel is a comprehensive guide to Hegel’s philosophy, from his first published writings to his final lectures. There are six chapters each on the Phenomenology of Spirit and The Science of Logic, in depth analyses of the Encyclopedia and essays on the major parts of the Philosophy of Right. Several chapters cover the many newly edited lecture series from the 1820s, bringing new clarity to Hegel’s conception of aesthetics, the philosophy of religion, and the history of philosophy. The concluding part focuses on Hegel’s legacy, from his role in the formation of Marx’s philosophy to his importance for contemporary liberal political philosophy. The Handbook includes many essays from younger scholars who have brought new perspectives and rigor to the study of Hegel’s thought. The essays are marked by close engagement with Hegel’s difficult texts and by a concern to highlight the ongoing systematic importance of Hegel’s philosophy.